Gallery of Modern Design. Photo courtesy of the ROM. The Royal Ontario Museum (ROM) opened its new Gallery of Modern Design this month. Featuring the iconic work of designers including Frank Lloyd Wright and Jacques-Émile Ruhlmann among others, the gallery traces the development of design in Europe and North America, highlighting six design movements from 1910 to 1965. 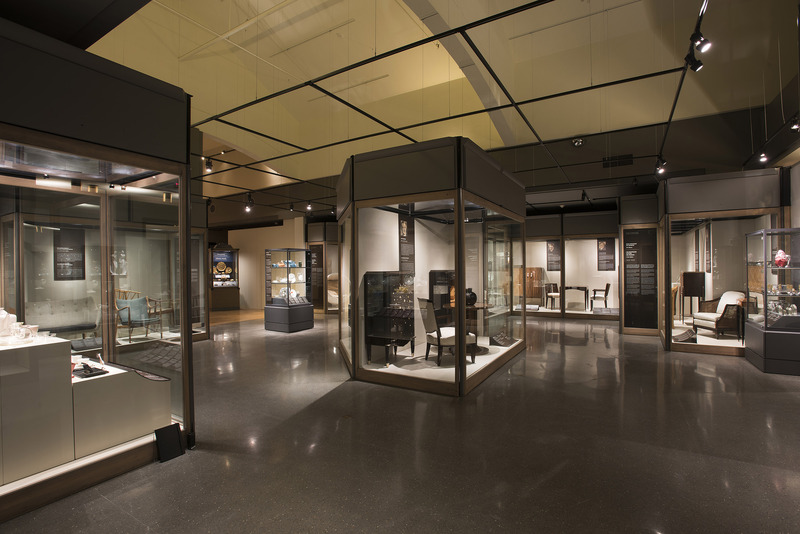 On display are many objects from the ROM`s Bernard and Sylvia Ostry collection including furniture, glassware, ceramics, silver, and other metalwork, prized for their beauty, rarity, and cultural significance. Other objects are publicly displayed for the first time. The gallery’s first section features French Art Deco designers including Jules Leleu and Jacques-Émile Ruhlmann whose finely crafted works demonstrate the movement’s full range of luxurious surface finishes. Section two showcases North American designers who expanded on French Art Deco to include streamlined and skyscraper design elements. Their style, Streamlined Modern or Modernist, is represented by works of Paul Frankl, Gilbert Rohde, and Norman Bel Geddes. Celebrated architect-designer Frank Lloyd Wright is also given prominence in this section. Section Three examines Germany’s influential Bauhaus School established in 1919 and the move by architects and designers to produce practical household goods that could be mass-manufactured for working-class consumers. Highlighted here are the “Wassily” lounge chair by Marcel Breuer and the Side Chair (MR533) by Ludwig Mies van der Rohe. The gallery’s focus shifts next to Scandinavia where, between the two World Wars, designers struggled with Historicism versus Modernism, and how to combine traditional furniture-making with modern technology. Danish furniture designer Kaare Klint is recognized internationally for placing Scandinavia at the core of the modern design movement. His “Barcelona” chair is featured here, as is other famous mid-century works by Finn Juhl and Hans Wegner—both synonymous with Danish modern design. The gallery ends with the period following WWII – International Modernism and Post-War Modern – where new materials and technologies allowed designers to respond to demand in mass consumer goods. Featured here are a George Nelson desk made by the Herman Miller Company, the “DAX” chair by Charles and Ray Eames, Eero Saarinen’s “Tulip” armchair, and Arne Jacobsen’s “Egg” lounge chair. Robert Little, the ROM’s Mona Campbell Chair of Decorative Arts, is the gallery’s curator. The Gallery of Modern Design is generously supported by a gift from the Chisholm Family in honour of Barbara Chisholm’s 40 years of volunteer service at the ROM and a grant from the Mona Campbell Endowment Fund. The Gallery of Modern Design, located on Level 3 Samuel European Galleries in the Hilary and Galen Weston Wing, is included with ROM General Admission.